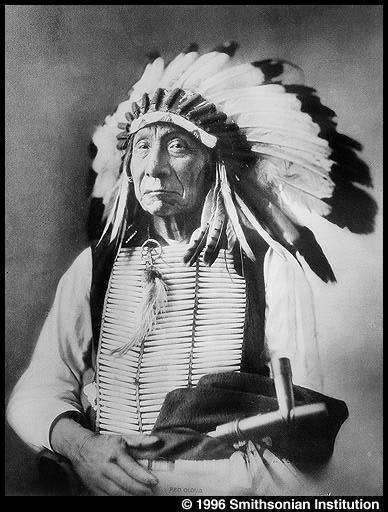 About the year 1880, at a time when the demand for large numbers of hair pipes for use in making elaborate breastplates was increasing, the Plains Indians began to obtain a cheaper and much less fragile hair pipe than the shell one long in use. The peculiar circumstances of the origin of this substitute – the bone hair pipe – comprise an interesting chapter in the history of Indian use of hair pipes which is at the same time a noteworthy case history in invention. 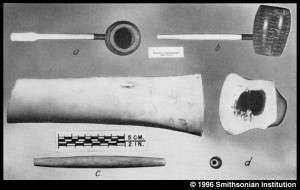 While I was stationed on the Blackfeet Reservation in Montana in the early 1940’s, both Frank Sherburne and his brother Joseph Sherburne, Browning merchants, independently told me of the role their father, the late Joseph H. Sherburne, had played in the invention of the bone hair pipe during his early days as a trader among the Ponca Indians. The Records of Licenses to Trade (vol. 5, p. 115) in the National Archives state that Joseph H. Sherburne was issued a license to trade with the Ponca Indians between Arkansas and Shawkaskia Rivers in the Indian Territory on September 10, 1878. Mr. Sherburne, desirous of pleasing the chief, wrote to S. A. Frost, in New York, from whom he had purchased glass beads and other articles for the Indian trade, explaining the problem and asking if it would be practical to furnish a quantity of long, tubular bone “beads.” Frost considered the matter and after he became convinced that the demand for this product was great enough to justify its perfection, set about having the bone articles made. However, a delay of more than a year was encountered before the new bone “beads” were ready for the market. When they became available in quantity Frost not only sold them to Mr. Sherburne but to many other traders on other reservations as well. Frost seems to have followed the pattern of the shell hair pipes which for so many years had been made for the Indian trade at Park Ridge, N.J., some 25 miles from his New York headquarters. Not only did the new bone beads follow the tapered form of shell hair pipes literally but they were made in approximately the same lengths as the shell pipes. They were, in reality, bone hair pipes and became known to Indian traders as hair pipes. hair pipe in the collections of the United States National Museum are shown together in plate 30,.
possible to offer them to Indians at a lower price than had been asked for shell hair pipes. 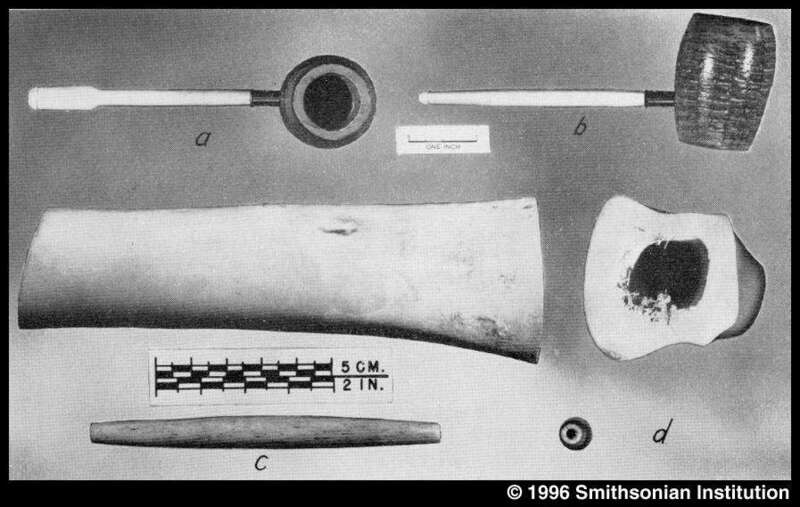 It must have been the pressure of competition with this cheaper, stronger bone hair pipe that caused the New Jersey shell hair-pipe makers to discontinue operations in 1889, less than a decade after bone hair pipes began to reach the Indian country. The Kiowa breastplate shown in plate 25, illustrates the transition from shell to bone hair pipes in Indian ornament. Of the 144 hair pipes in this specimen, 49 (at the top) are of bone. The remainder, including two broken pipes, are of shell. This specimen, USNM No. 152842, was collected by James Mooney in 1891. 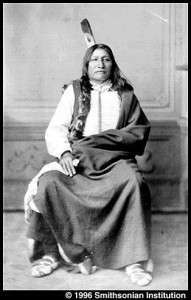 It must have been made up during the preceding decade when bone hair pipes were beginning to replace shell hair pipes in the Kiowa trade. In the period of general economic depression among the Plains Indians following the extermination of the buffalo, during which they subsisted largely upon Government rations, possession of an elaborate hair-pipe breastplate or necklace was a coveted symbol of greater-than-average prosperity among these proud people. Not only did the Indians wear these ornaments when they attended ceremonies and participated in traditional social dances on their own reservations, but they wore them when they dressed to visit the Great White Father in Washington, when they took part in wildwest shows, such as the famous one organized by William F. Cody (Buffalo Bill) in 1883, and when they appeared in costume at national, regional, State, and local exhibitions or fairs. The cessation of intertribal wars after the Plains Indians were settled on reservations was followed by a period of increased friendly contacts between neighboring tribes formerly hostile to one another. Visits back and forth among these Indians were accompanied by the exchange of gifts between members of different tribes. These conditions encouraged diffusion of hair-pipe breastplates and necklaces during the Reservation Period. 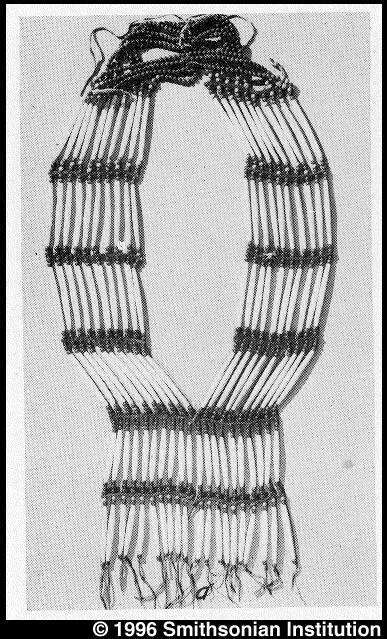 Pictorial sources reveal the continued use of hair-pipe breastplates during the Reservation Period by men of all those tribes known to have made use of this ornament prior to 1880, i. e., the Comanche, Kiowa, Kiowa Apache, Ponca, and Pawnee in the south; the Arapaho and Cheyenne in Oklahoma, Wyoming, and Montana; the Teton Dakota of the Dakotas; and the Ute west of the Rockies. Tribes of the Oklahoma region preferred the wide, relatively short breastplate comprising 4 or more rows of short to medium-length pipes, rarely more than 30 pipes per row. This type was worn by Quannah Parker, the famous Comanche chief, in 1892 (pl. 32, a). It was also worn by the prominent Kiowa leader Running Bird when he attended the intertribal Indian council on the Little Big Horn in 1909 (Dixon, 1913, illus. opp. p. 52). St. Louis Exposition in 1904, Little Soldier, an Oglala, wore a 2-row breastplate containing a total of 140 long pipes (Chicago Mus. Nat. Hist., neg. 15932). This is the largest hair-pipebreastplate of which I have knowledge. It was apparently from the Teton that this type of breastplate was diffused to other Siouan tribes north of the Platte River. 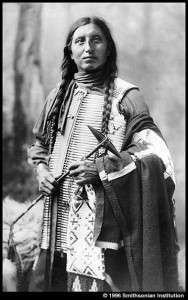 Photographs portray the wearing of the 2- or 3-row breastplate by men of the Assiniboin (1882), Omaha (1909), Yanktonai (1903), and Yankton (1904) tribes.12 My elderly Assiniboin informants in 1953 stated that the first breastplates worn by men of their tribe came from the Sioux (Teton), although the Assiniboin themselves began to make them in the 1880’s. They claimed the Assiniboin of Fort Peck Reservation began to wear these breastplates before they were adopted by men of that tribe living farther west on Fort Belknap Reservation. 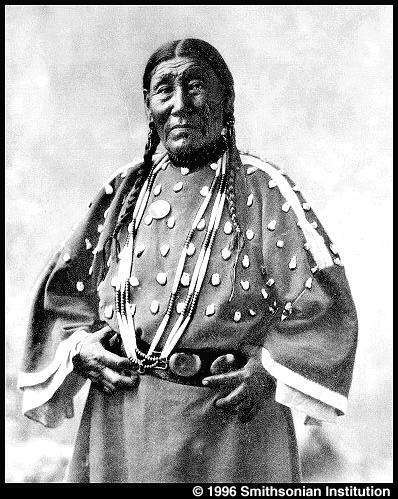 However, the Crow Indians were little impressed by the hair-pipe breastplates of their former enemies, the Teton. The large [p. 66] series of Crow photographs in the Bureau of American Ethnology files do not depict a single example of the use of this ornament. 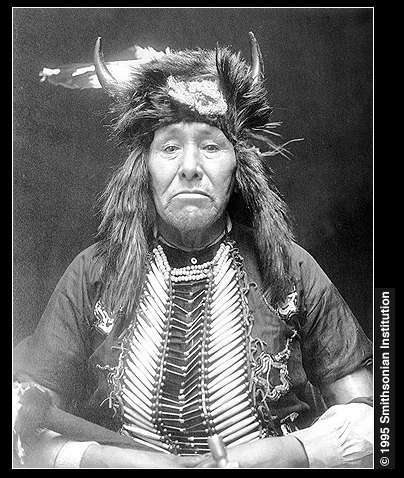 In the spring of 1953, an elderly Crow informant told Dr. Claude Schaeffer that hair-pipe breastplates were not favored by the older Crow men and that it has been only in recent years that young Crow Indians have worn these ornaments in the grass dance. 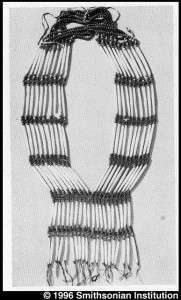 Men of the Blackfoot tribes also showed relatively little interest in hair-pipe breastplates. Piegan and Blood informants told me that men of their tribes did not make them but acquired a few breastplates from the Assiniboin as gifts, possibly as early as 1893. Among the Blackfoot they were worn primarily in the grass dance and other social dances. R. N. Wilson’s photograph of Assiniboin grass dancers on a visit to the Blood Reserve in 1893 depicts the wearing of hair-pipe breastplates by two or three participants (pl. 36, b). The Chicago Museum of Natural History possesses a photograph (neg. 26672) taken at the Piegan Sun Dance of 1899, showing two wearers of hair-pipe breastplates. ockies. Photographs show the wearing of this ornament by men of the Bannock (1897), Flathead (no date), and Yakima (1902) tribes. Major Moorhouse’s photographs, taken about 1900, show hair-pipe breastplates worn by Shoshoni, Nez Percé, Walla Walla, and Sinkiuse men.13 Two undated prints in the Division of Ethnology, United States National Museum, portray hair-pipe breastplates worn by Colville and Wasco men. Spinden (1907, pp. 217-218) was of the opinion that the bone-bead (hair pipe) breastplates worn by Nez Percé men were “undoubtedly introduced from the Plains.” He found these breastplates were less common among the Nez Percé than were breast ornaments composed of several strings of small disk-shaped beads. 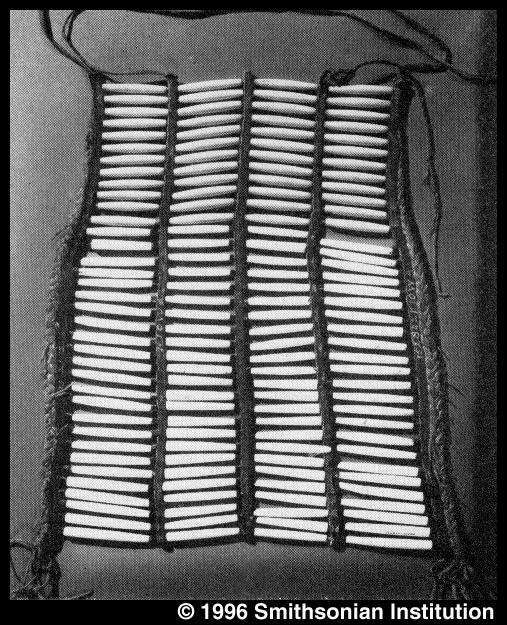 Teit (1930, p. 81) reported the wearing of “breastplates of long, polished bone beads” [hair pipes] by Coeur d’Alêne men in the early years of the present century. However, his statement that they were “adopted by the Coeur d’Alêne about the beginning of the 19th century” must be discounted. It is unlikely that that tribe began to wear hair-pipe breastplates before the 1890’s. The hair-pipe breastplate does not appear to have gained popularity among the Indian tribes east of the Mississippi. 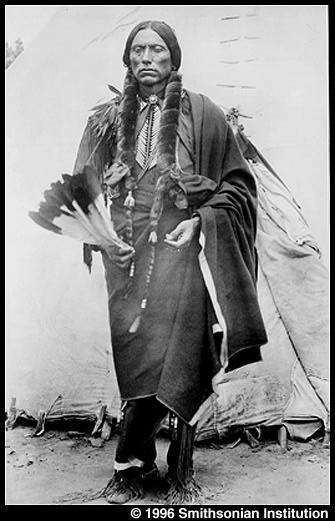 However, a portrait of Joseph Sherritt of the White Earth Band of Chippewa, taken in 1911, shows him wearing a two-row breastplate of hair pipes (pl. 31, b). Another two-row breastplate, collected in 1911 among the Chippewa of White Earth Reservation, Minn., is in the collection of the United States National Museum (cat. No. 392661). In 1917 the Plains Cree leader, Little Bear, gave Frank Bird Linderman a breastplate of bone hair pipes of the 2-row pattern, 35 pipes per row. The hair pipes are 4 ½ inches long. This specimen (Museum of the Plains Indian, cat. No. 539L) may have been in Little Bear’s possession for a number of years prior to 1917. Information and Photos gathered from the Smithsonian institute Libraries. This information shows the constant adaptation of tribal life and how trade was an integral part of many tribes before, during and even after the european settling of the Americas. This entry was posted in Native History. Bookmark the permalink.